Welcome to Arts & Architecture. In the case of some, maybe, welcome back. 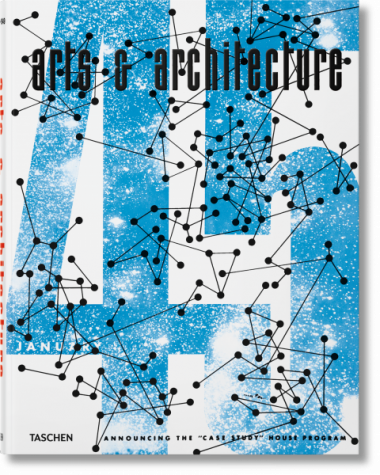 It’s a wonderful thing that TASCHEN has done — reprinting first Domus magazine, then the complete Arts & Architecture, 1945–54. And now, publisher Benedikt Taschen has personally selected his favorite covers and stories, to be published in several hardcover volumes. My first thought when approached about the original complete reprint was that the project was impossibly retro. TASCHEN had already done a physically immense reproduction of Arts & Architecture’s Case Study House program. That seemed to me to be sufficient. After all, the magazine was best known, almost exclusively so, for this 20-year-long program sponsoring new ideas in residential design. But A&A was more than that. It is difficult, maybe impossible, to understand a time that is not your own, to feel the excitement of the 1940s, ’50s and ’60s if you were not a part of them. The World War II years and the post-war period in the United States were an energetic mix of culture and politics, and A&A was at the leading edge in architecture, art, music — even in the larger issues of segregation in housing and education and other manifestations of racial bias before they became codified as civil rights. The magazine was hopeful about life; it had a sense of mission. Above all, however, Arts & Architecture acted like sunshine on West Coast architects who grew and flourished under its rays: Richard Neutra, R.M. Schindler, Harwell Harris, Gregory Ain, Charles Eames, Lloyd Wright, John Lautner, Ed Killingsworth, the carpenters in steel — Raphael Soriano, Craig Ellwood, Pierre Koenig — and in the north Campbell & Wong, William Wurster. The list must end but seems endless. The magazine’s Los Angeles headquarters became the center for Southern California architects with a common cause, whose modest, low-cost, modern and remarkably efficient designs laid the foundation of the Case Study House program and reinvented the single family dwelling. Although aware of it, the East Coast professional and trade press, such as Progressive Architecture, AIA Journal and House & Garden, had largely ignored the West Coast revolution in residential design until the 1950s. The “sing fam dwell” didn’t interest them or their advertisers much. But when architectural journals around the world — particularly the European journals — began to pick up the CSH projects, the East Coast press could no longer treat them as an inconsiderable regional anomaly. Publication in Arts & Architecture became a door to national and international renown for West Coast architects. Reyner Banham said A&A changed the itinerary of the Grand Tour pilgrimage for European architects and students: America replaced Italy and Los Angeles was its Florence. To step back to the beginning, California Arts & Architecture was formed in 1929 by a merger of Pacific Coast Architect, established 1911, and California Southland, established 1918. Architecturally it was devoted to eclectic residential design — Tudor, Spanish Colonial, Mediterranean, Georgian, California amorphous. It preferred classic style in larger projects, and now and then Art Deco. In 1930 it was a substantial magazine. Issues ran from 70 to 80 pages with lots of advertising. By 1933 the Great Depression had starved it down to 30 pages and subsequently into bankruptcy, where John Entenza found it in 1938. Entenza was educated in esthetics at University of Virginia. Under his editorship, California changed from a review of “nostalgic historicism” presenting eclectic houses for the rich and famous to an avantgarde magazine publishing low cost houses rich with social concern. In the January 1943 issue, the presentation of the Harris House by R.M. Schindler, which cost $ 3,000, was a wonderful harbinger of things to come. The story goes that California was dropped inadvertently from the magazine’s name by the printer. It did disappear from the cover of the September 1943 issue but reappeared the next month. My belief is that the missing California was an “accident” engineered by the wily advertising manager, Robert Cron, who must have believed that there would be advertising advantages if A&A went national. In any case, California was dropped permanently from the cover and masthead without comment in February, 1944. It was the policy of A&A to present projects without any accompanying critical analysis. The buildings were allowed to speak for themselves and any explanatory text was limited to a brief statement, usually based on a description of the program and the structure supplied by the architect. The reasons behind the policy were simple enough and did not include fear of offending an advertiser or architect, as has been suggested from time to time. To be selected for presentation, a project had to be one of exceptional merit and interest. Not free of faults but the good qualities had to heavily outweigh any bad ones. Where the reverse was true, we did not publish the building. It was dismissed rather than criticized. A&A continued to find and publish young architects in the 1960s. Frank Gehry (with then partner Greg Walsh) was first published in A&A and our presentation of a Richard Meier beach house on Fire Island in January 1964 was his first publication. And we introduced Hans Hollein to America. But by the 1960s — despite the popularity of the Case Study Houses and the magazine’s influence on the design of the sing fam dwell — only 3 percent of houses, the bread and butter of the small office, were designed by architects. In residential design, developers had won. architects. When I removed A&A from life support in September 1967, we had 12,500 paid subscribers (including 300 in the Soviet Union). This compared to between 40,000 and 50,000 registered architects each for P/A, Architectural Record, Architectural Forum and the AIA Journal. Little wonder that the advertising went to them. In truth, A&A was never a money-making venture. As Esther McCoy wrote, “It was a shoestring operation, as avant-garde magazines have always been in the U.S.” I would go further: it was a shoeless operation. My years were a constant scramble for money. In 1965, George Dudley, founding dean of the UCLA School of Architecture and Urban Design and then UCLA chancellor Franklin Murphy tried without success to get the university’s Board of Regents to adopt the magazine. Similarly, Martin Meyerson, dean of architecture at UC Berkeley, wanted A&A but when he was named chancellor of the university, his horizons grew and the idea was abandoned. would be insufficient return on the investment. There was much strife caused by this decision and the foundation closed its Californian doors. A&A soon followed suit. A defrosted cryogenized modern movement architect from the A&A era would be dumbfounded by contemporary design. Architecture, which used to be serious but fun, is now seriously silly. Innovative straight-line, geometrical, rational, less-is-more architecture has been replaced by novelty, by glib, zigzag, crumpled, broken, exploded and discontinuous designs, by “constructive alienation.” There’s an absence of social significance, of moral and ethical meaning, and not just in housing. architectural narcissism evident today and back to proportion and civilized sensibilities. Bring Arts & Architecture back with all its memories? Hmm. Well, here it is.